This Q&A is the fall 2018 installment of the Medieval Institute’s Alumni Spotlight series. Lockett is the author of Anglo-Saxon Psychologies in the Vernacular and Latin Traditions (University of Toronto Press, 2011) and several articles and book chapters on topics ranging from Anglo-Saxon Latinity, medieval mind-body theory, the history of the emotions, and the well-known Junius 11 manuscript, one of only four surviving codices of poetry from the Anglo-Saxon period. 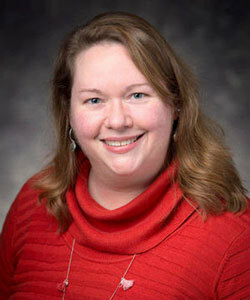 She is currently preparing an edition and translation of the Old English Soliloquies and Augustine’s Soliloquia that will appear in the Dumbarton Oaks Medieval Library series, and she was most recently a 2016-2017 fellow of the Notre Dame Institute for Advanced Study. What interested you in the Middle Ages initially? What hooked you? There were two things, both in high school English classes: in my junior year class we learned about the history of the language and watched that old PBS documentary “The Story of English.” It’s kind of dated now, but it was really entertaining. I remember being so struck the first time I saw a comparison of the Lord’s Prayer in Old English, Middle English, and the King James Bible — I didn’t even know this part of our language existed. The opening leaf of the Ellesmere Chaucer (San Marino, Huntingdon Library, mssEL 26 C 9). This image comes from the facsimile owned by Notre Dame. Then, in senior-level English, we read a lot of Chaucer in Middle English. To prepare us for that, our summer reading was an historical novel by Anya Seton called Katherine, and it was about Katherine Swynford, Geoffrey Chaucer’s sister-in-law. It’s a sappy historical romance filled with the most beautiful, captivating details about late 14th-century England, and I was so drawn in by it. That was a brilliant way to encourage students, who probably would not have absorbed a more plotted history of late medieval England, to really embrace this material and gain a real sense that they could inhabit the world Chaucer describes. When I went to college, I had no inkling about being a medievalist. I didn’t know it was a thing that could be done professionally. I was a pre-med biology major. Pre-meds had to have a couple of English classes on their transcripts, so I took a Chaucer class and really, really liked it. The professor, Howell D. Chickering, who recently retired, is famed for his amazing facing-page edition and translation of Beowulf. He really values the oral side of poetry, and that made a huge impression on me in the Chaucer class and when he taught a bit of Beowulf the next year. Eventually, as I was finishing up my pre-med requirements, I met a history major who was planning to go to graduate school to become a history professor. I thought, Really? You can do that? I didn’t know what I wanted to do career-wise, so I applied through a teacher placement agency to teach in private prep schools because they were looking for people with good transcripts and a good manner in the classroom, but not necessarily any teacher training. So, at one school, I had a one-year position teaching biology and coaching rowing, and then another position, the next year, at a school in Tennessee, teaching four sections of eighth-grade Latin. I switched the next year to the science department and became the head rowing coach. The year before I started the Ph.D. program at the Medieval Institute, I was teaching honors biology to ninth-graders and chemistry to tenth-graders, and I took the girls rowing team to the Tennessee State Championships! What did you work on as a graduate student? I wrote my dissertation on early medieval concepts of the mind, whether the mind is part of the body or part of the soul. Everyone tends to think Augustine already solved that problem once and for all, but in Old English literature, the mind is portrayed as a corporeal thing in the chest cavity, in or around the heart. Half of my argument was that we don’t have any good reason to read this as metaphor like we might today. To say that the Anglo-Saxons used it as a metaphor implies that they actually had some other theory of what the mind was and that this was a stand-in narrative, or an artistic expression. But there wasn’t another theory of the mind; this was their folk theory. 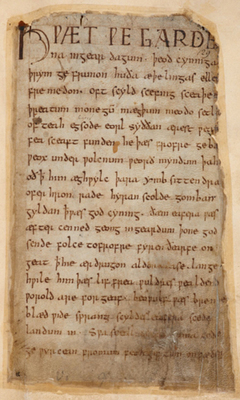 The opening leaf of the Anglo-Saxon poem Beowulf (London, British Library, Cotton MS Vitellius A XV, fol. 132r). The manuscript was heavily damaged by fire in 1731. At the same time, I wanted to show that in Latin learned traditions, not just in England, but on the continent as well, there’s a much greater diversity of opinion than people think about what the substance of the mind was, even among those who would maintain that it was part of the transcendent soul instead of part of the body. The idea of the transcendent soul as having some sort of substance hadn’t been completely snuffed out by the fifth century. The general perception, especially in Irish and grammatical traditions, is of a lag time before everyone walked lockstep with the Neoplatonist idea of a completely immaterial rational soul. That idea was not as ironclad as people thought. In my work now, I’m figuring out how the Old English Soliloquies, coming from Augustine’s Dialogues, represent the tail end of this interest on the part of the Carolingians. 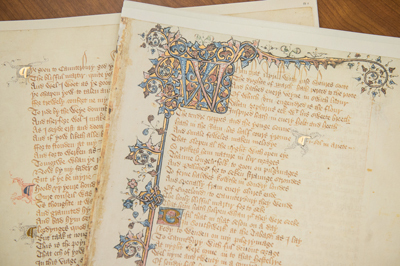 What was it like moving from the Ph.D. program at the Medieval Institute to a traditional English department? Being a medievalist first and English person second has worked out great for me because I went to such a big department that they could hire someone who was clearly not trained as a generalist. The first time I taught the British Literature survey (Beowulf to 1800), I was relieved to have a teaching apprentice in my class who could give two lectures on Milton because it was new material to me. Whereas the students in English who went through at the same time I did were taking lots of courses that helped them to be successful generalists, I didn’t do that in the Medieval Institute. Fortunately, at a really big school, I get to teach medieval Latin, manuscript studies, and the kinds of topics that people say you will never get to cover once you get into a department. This OSU job came up in my sixth year, and I had always figured that I would take a seventh year to finish writing my dissertation. Then, my advisor said I should at least put in for it, so I applied for that and a general medievalist position. I was quite shocked to have to finish because I got the OSU job, and that’s a story that people don’t get to tell anymore. The job market doesn’t do people that kind of favor very much anymore. What’s your advice for people who would like to follow your career track? I mean this in the nicest way possible: don’t count on it. The big question is whether it is ethical to accept more graduate students than there are tenure-track positions. I wish we could change the culture around this mentality and understand that having six years of almost guaranteed poverty-line salary doing fun, gratifying work is not valuable only as preparation for a tenure-track career. If I knew I weren’t going to get a job after graduate school, I would have still gone ahead and spent the six to eight years in the Medieval Institute because it was an awesome experience and, in South Bend at least, there was no problem living on a graduate student stipend. I’m both very nostalgic for Notre Dame and very grateful for what I got here as a grad student. I got such good training while I was here that it’s equipped me to do work that I find really interesting and stimulating. I remember writing in my application letter to come to Notre Dame that I didn’t care if I ever got a tenure-track job. I would go back to teaching high school Latin because I love it. I wanted to come here and study Latin and manuscripts. I never had the expectation that I would end up with an office and graduate students. I’m both very nostalgic for Notre Dame and very grateful for what I got here as a grad student. I got such good training while I was here that it’s equipped me to do work that I find really interesting and stimulating. I wish that instead of having it be a terrifying panic at the end, that people would go into the Ph.D. with alt-ac careers in mind in the first place. I’m glad for the alt-ac options, not just because I don’t want to see recent and about-to-be Ph.D.s suffer, but because the world could use more Ph.D.s in different places. In terms of advice for current graduate students though, prioritize a small number of quality publications. Don’t say yes to every opportunity that comes your way. People want to see that you have placed a couple of pieces in really prestigious peer-reviewed journals. That will go farther on the job market than a half dozen book reviews or publications in the more down-market journals. Aim high and prioritize quality over quantity. Editor’s note: This interview has been edited for length and clarity. Interview by Brandon Cook.